Imagine every time you tried to speak, somebody stopped you and spoke on your behalf? Imagine that what they said was rarely what you wanted them to say? By choosing not to register and/or choosing not to vote, you put your voice in the hands of somebody else, somebody you didn’t choose. Registering and voting are two different things. 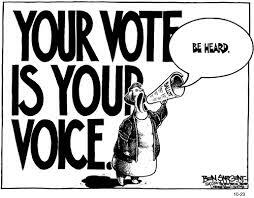 In order to receive a voting card for May 23rd, you must be registered with your local authority. If not, you’re name wont be on the register of electors and you won’t be able to vote. By registering to vote, at least you have the choice to vote. I know that many people feel let down, ignored and angered by many of the politicians we currently have in Ireland, I feel the very same about many decisions they make. If you feel there is nobody to represent you at a political level, maybe you should put yourself forward, or, vote for somebody who is closest to what you believe in. I encourage you to make sure you are registered and to use your vote on the day. I will support you in any way that I can, whether it’s assisting you in completing the form or getting it stamped, feel free to get in touch with me.